The Tea District began in 2005, when a young, restless, and courageous entrepreneur decided it was time to take the bull by the horns and start what would be the beginning of a long journey. A fun journey. And a dream come true. It was her chance to create a brand that will be known worldwide for its sophisticated, premium teas and the dynamic accessories that help create a relaxing evening, comforting work day, and healthy life. 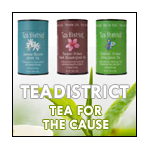 They created a brand and launched TeaDistrict.com, to allow customers to shop beyond the coffee and tea shop and retail stores, offering an assortment of fair trade teas and accessories to go with them. TeaDistrict.com continues to grow and add additional blends of tea daily. Tea District is committed to fostering the world's best premium teas bestowing a fascinating customer experience to ensure a loyalty to our brand and provide growth from its quality and knowledge of tea. Check out their huge selection of premium fair trade and organic teas today.